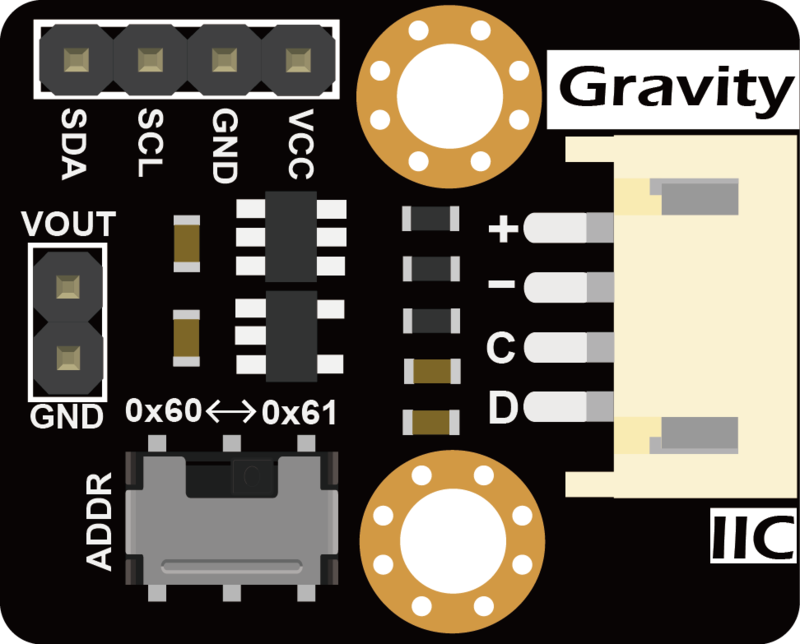 DFRobot Gravity 12-Bit I2C DAC is a small and easy-to-use 12-bit digital-to-analog converter with EEPROM. It can accurately convert the digital value to corresponding analog voltage signal, which is useful in may creative projects and automatic control systems. Although an analog voltage signal can be generated by PWM with traditional controllers such as Arduino and Raspberry Pi, such signal is ROUGH and NOT ACCURATE. To obtain a steady and nice analog voltage signal, the DAC is the best candidate. In addition to be applied in automatic control systems, the DAC module can be use to serve as a function generator to generate sine wave, triangular wave and even arbitrary waveform (we provide a library to generate low frequency sin and triangular wave with just a few parameters). The module employs a 12-bit DAC MCP4725. It requires no external reference voltage (DAC reference is driven from VCC directly), supports 3.3V~5V wide input voltage and has a I2C address selection switch (two address 0x60 and 0x61 are available, which support maximum two modules in cascade). The EEPROM can retain the DAC input while power-off and resume the DAC output upon power-on. Download and install the MCP4725 Library. How to install the library? Although the DAC's voltage output accuracy is affected by several factors that cause the actual output voltage to deviate from the user-specified voltage values, the DAC reference voltage, Vref, of the MCP4725 is the same as the supply voltage VCC, and the supply voltage is usually not accurate (the actual voltage is not exactly 5.000 V or 3.300V), which results in large output error. Here, we provide a simple calibration method to eliminate the error caused by the inaccurate reference voltage. If calibration is not carried out, users can still simply set REF_VOLTAGE to 5000 in the code below (for a 5V controller such as an Arduino) or 3300 (for a 3.3V controller such as Raspberry Pi, FireBeetle) depending on the controller used. 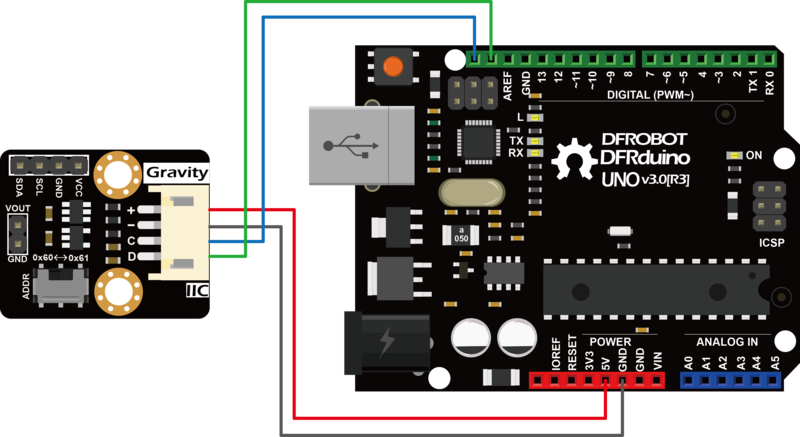 Connect the module to the Arduino according to the connection diagram above and set I2C address to 0x60 by ADDR switch on the module. If I2C address 0x61 is preferred, you need to modify the first parameter of the function DAC.init() in the code below. Use the multimeter to measure the output voltage of VOUT and change the value of REF_VOLTAGE accordingly. For example, VOUT = 4950mV, the "#define REF_VOLTAGE 5000" should be revised to "#define REF_VOLTAGE 4950". Calibration completed. Change the value of OUTPUT_VOLTAGE (unit in mV) to your desired analog output voltage. This value should be smaller than REF_VOLTAGE or the maximum output voltage will be limited to REF_VOLTAGE. Before using the sample code below, write the calibration value to REF_VOLTAGE first to get a more accurate output voltage. * Output a constant voltage value and print through the serial port. Set the I2C address to 0x60 with the ADDR switch. For I2C address 0x61, you need to modify the first parameter of the function DAC.init () in the code below. Open Arduino IDE, upload the following sample code to the Arduino UNO, and use a digital multimeter to measure the output voltage of VOUT. The user can change the value of OUTPUT_VOLTAGE to change the analog voltage output. REF_VOLTAGE can be set to the value used in the Calibration section. If not calibrated, simply set it to 5000 (for 5V controllers such as Arduino) or 3300 (for 3.3V controller such as Raspberry Pi, FireBeetle etc.) . * Output a constant voltage value and write to the internal EEPROM. A 1V voltage signal can be measured at VOUT. Disconnect the module from the Arduino. Repower the module, by connecting oinly the VCC and GND pins of the module to 5V and GND on the Arduino, respectively. The user can still read 1V at VOUT. The function DAC.outputVoltageEEPROM () stores the DAC value in the EEPROM while it outputs a specified analog voltage signal. The module recalls the DAC value in the EEPROM upon power-up and restores the analog output at VOUT. Set the I2C address to 0x60 with the ADDR switch. For I2C address 0x61, you need to modify the first parameter of the DAC.init () function in the code below. Open Arduino IDE, upload the following sample code to the Arduino UNO, and use a oscilloscope to measure the output voltage of VOUT. The user can modify the parameters in the function DAC.outputSin () to change the amplitude, frequency and DC offset of the sine wave. A full sine wave of 2.5V in amplitude (5V peak to peak), 10Hz and 2.5V DC bias can be observed. Function description: generate a Vo=Voffset Vp*sin(2*pi*f*t) sine waveform. When Vo>REF_VOLTAGE, Vo=REF_VOLTAGE; When Vo<0, Vo=0. amp: unit in mV. Set the amplitude Vp of the sine wave. The value range 0 ~ REF_VOLTAGE. When this value is larger than REF_VOLTAGE, amp=REF_VOLTAGE. When amp is set to 0, the function return a DC signal with amplitude determined by offset. freq: unit in Hz. Set the frequency of the sine wave. The value ranges 0 ~ 100. When this value is larger than 100, it takes 100; when it is equal to 0, the function returns a DC signal. offset: unit in mV. Set the DC offset Voffset of the sine wave. The value ranges 0 ~ REF_VOLTAGE. When this value is larger than REF_VOLTAGE, amp=REF_VOLTAGE. The user can modify the parameter in DAC.outputTriangle () to change the amplitude, frequency, DC offset and duty cycle of the triangular wave. *the rise of the entire cycle accounted for 50% of the DC offset 0mv triangular wave. 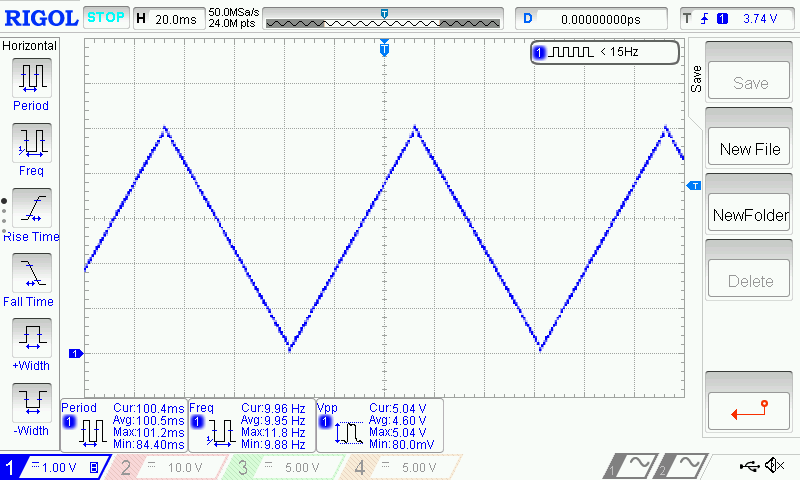 function description：generate a triangle wave Vo. When Vo>REF_VOLTAGE, Vo=REF_VOLTAGE; When Vo<0, Vo=0. amp: unit in mV. Set the amplitude of the triangle (sawtooth) wave. Value ranges 0 ~ REF_VOLTAGE. When this value is larger than REF_VOLTAGE, amp=REF_VOLTAGE. freq: unit in Hz. Set the frequency of the triangle (sawtooth) wave. Value ranges 0 ~ 100. When this value is larger than 100, freq=100; When this value takes 0, the module outputs a constant 0V. offset: unit in mV. Set the DC offset of the triangle (sawtooth) wave. Value ranges 0 ~ REF_VOLTAGE. When this value is larger than REF_VOLTAGE, offset=REF_VOLTAGE. dutyCycle: unit in percentage (%). Set the duty cycle of the triangle (sawtooth) wave. This value ranges 0 ~ 100. When dutyCycle equals 0 or 100, it becomes a sawtooth wave. Change the dutyCycle to 0 while the other parameters remain the same. That is "DAC.outputTriangle (5000,10,0,0)", which can generate a 10Hz sawtooth wave of 5V in amplitude. Connect the module to the Raspberry Pi according to the connection diagram above and set I2C address to 0x60 by ADDR switch on the module. If I2C address 0x61 is preferred, you need to modify the parameter of the function mcp4725.setAddr_MCP4725() to MCP4725A0_IIC_Address1. 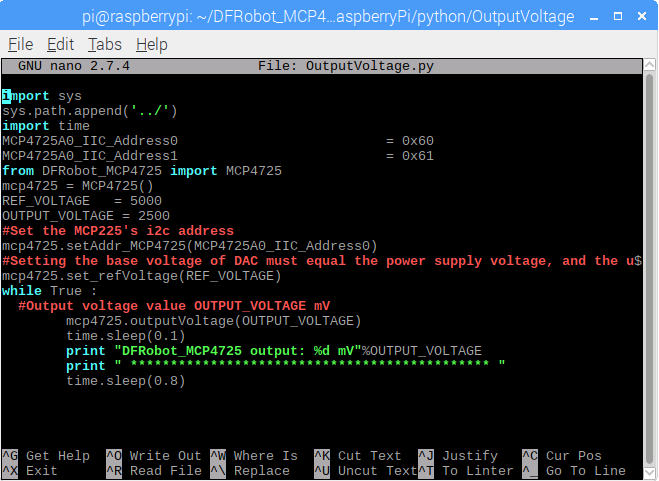 Open Python codes OutputVoltage.py and change both REF_VOLTAGE and OUTPUT_VOLTAGE to 5000 (if the module uses 3.3V, change to 3300). Use the multimeter to measure the output voltage of VOUT and change the value of REF_VOLTAGE accordingly. For example, VOUT = 4950mV, the "#define REF_VOLTAGE 5000" should be revised to "REF_VOLTAGE 4950". Calibration completed. Right click on the Python source code "OutputVoltage.py" in the directory. 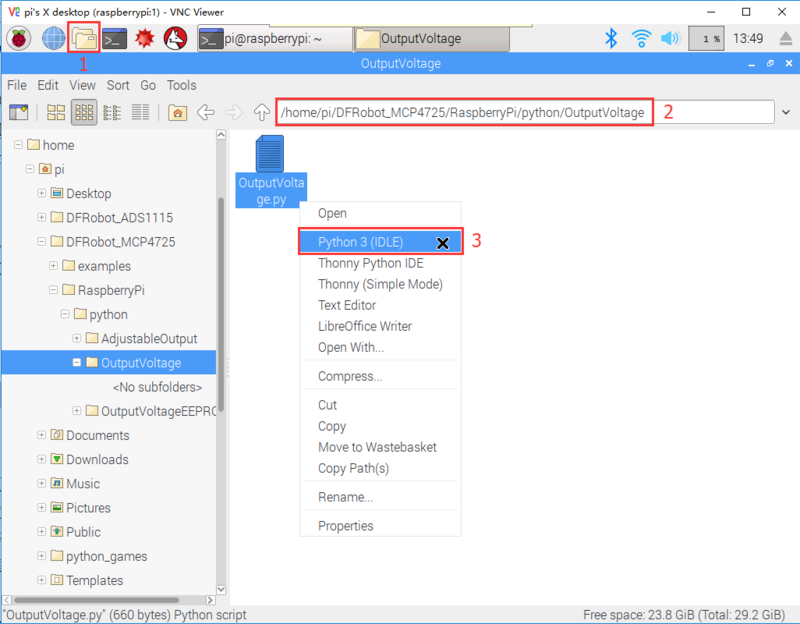 Select “Python 3 (IDLE)” from the menu and edit the Python program in the pop-up window. After editing, use the shortcut “Ctrl S” to save and closed window. After entering the commands, a Python program is opened using the nano editor. After completing the code modification, use the shortcut “Ctrl O” to save, press Enter to confirm, and then use the shortcut “Ctrl X” to close the nano editor. 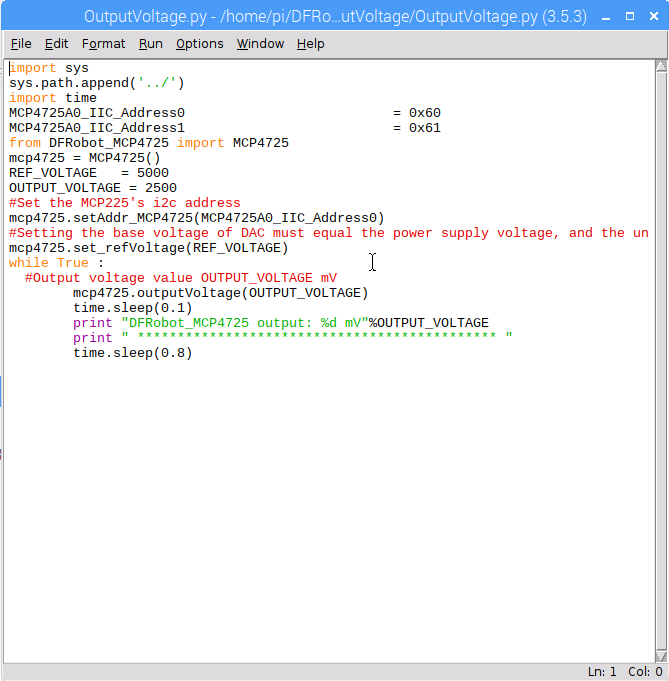 The user can modify the OUTPUT_VOLTAGE in the OutputVoltageEEPROM.py to change the output value of the analog voltage. REF_VOLTAGE can be changed according to the calibration section. If no calibration is done, enter 5000 (5V) or 3300 (3.3V) depending on the VCC power supply. A 1V voltage signal can be measured at VOUT. Disconnect the module from the Raspberry Pi. Repower the module, by connecting only the VCC and GND pins of the module to 5V and GND on the Raspberry Pi, respectively. A 1V can still be read at VOUT. The function mcp4725.outputVoltageEEPROM() stores the DAC value in the EEPROM while it outputs a specified analog voltage signal. The module recalls the DAC value in the EEPROM upon power-up and restores the analog output at VOUT. REF_VOLTAGE can be changed according to the calibration section. If no calibration is done, enter 5000 (5V) or 3300 (3.3V) depending on the VCC power supply. 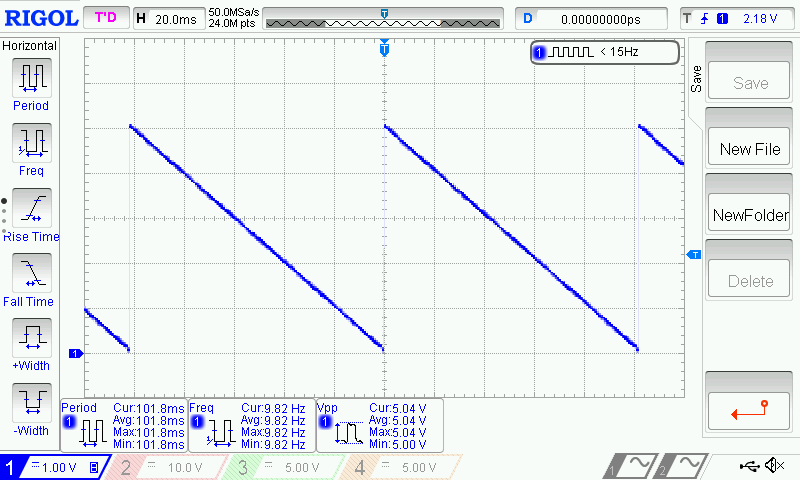 Use an oscilloscope to observe the VOUT output voltage waveform. The user can modify the parameters in the function mcp4725.outputSin() to change the amplitude, frequency and DC offset of the sine wave. freq: unit in Hz. Set the frequency of the sine wave . The value ranges 0 ~ 40. When this value is larger than 40, it takes 100; when it is equal to 0, the function returns a DC signal. The user can modify the parameters in the function mcp4725.outputTriangle() to change the amplitude, frequency, DC offset and duty cycle of the Triangle wave. A full triangular wave of 5V (peak-to-peak), 10Hz, duty cycle of 50% without DC bias can be observed. freq: unit in Hz. Set the frequency of the triangle (sawtooth) wave. Value ranges 0 ~ 40. When this value is larger than 40, freq=40; When this value takes 0, the module outputs a constant 0V. Change the dutyCycle to 0 while the other parameters remain unchanged. That is "DAC.outputTriangle (5000,10,0,0)", which can generate a sawtooth wave of 5V in amplitude and 10Hz. Q1. Why the highest frequency of the waveform provided by the MCP4725 library is only as high as 100Hz? Is it possible the frequency can be set higher? A. The MCP4725 uses I2C to communicate with the controller. When using traditional controllers such as the Arduino, the fastest mode, Fast (400kbps), can only be used. Under such transfer speed, DAC module can barely reached 100 Hz. The MCP4725's I2C supports high-speed mode, High-speed (3.4Mbps), but most of the mainstream controllers does not support this I2C mode. In sum, limited by the communication interface, the output frequency is difficult to be further improved. For more questions, advice or cool ideas to share, please visit the DFRobot Forum. 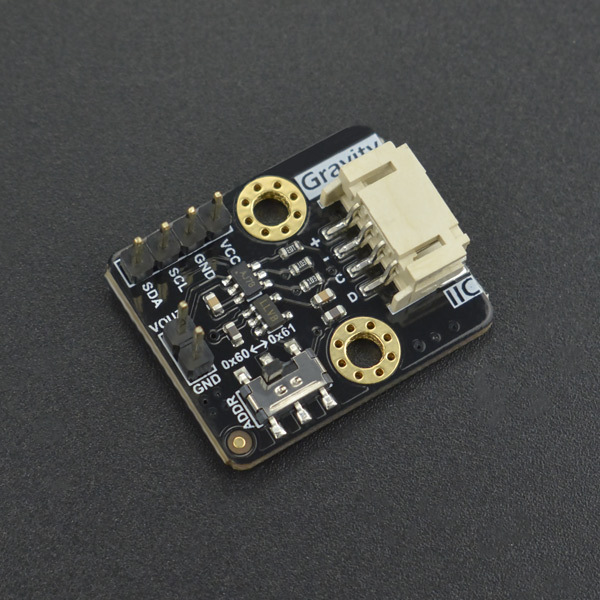 Get Gravity: I2C 12-Bit DAC Module from DFRobot Store or DFRobot Distributor.